Cellulose is the substance that makes up most of a plant's cell walls. Since it is made by all plants, it is probably the most abundant organic compound on Earth. Aside from being the primary building material for plants, cellulose has many others uses. According to how it is treated, cellulose can be used to make paper, film, explosives, and plastics, in addition to having many other industrial uses. The paper in this book contains cellulose, as do some of the clothes you are wearing. For humans, cellulose is also a major source of needed fiber in our diet. Cellulose is usually described by chemists and biologists as a complex carbohydrate (pronounced car-bow-HI-drayt). Carbohydrates are organic compounds made up of carbon, hydrogen, and oxygen that function as sources of energy for living things. Plants are able to make their own carbohydrates that they use for energy and to build their cell walls. According to how many atoms they have, there are several different types of carbohydrates, but the simplest and most common in a plant is glucose. Plants make glucose (formed by photosynthesis) to use for energy or to store as starch for later use. A plant uses glucose to make cellulose when it links many simple units of glucose together to form long chains. These long chains are called polysaccharides (meaning "many sugars"
and pronounced pahl-lee-SAK-uh-rydes), and they form very long molecules that plants use to build their walls. It is because of these long molecules that cellulose is insoluble or does not dissolve easily in water. These long molecules also are formed into a criss-cross mesh that gives strength and shape to the cell wall. Thus while some of the food that a plant makes when it converts light energy into chemical energy (photosynthesis) is used as fuel and some is stored, the rest is turned into cellulose that serves as the main building material for a plant. Cellulose is ideal as a structural material since its fibers give strength and toughness to a plant's leaves, roots, and stems. Since cellulose is the main building material out of which plants are made, and plants are the primary or first link in what is known as the food chain (which describes the feeding relationships of all living things), cellulose is a very important substance. It was first isolated in 1834 by the French chemist Anselme Payen (1795–1871), who earlier had isolated the first enzyme. While studying different types of wood, Payen obtained a substance that he knew was not starch (glucose or sugar in its stored form), but which still could be broken down into its basic units of glucose just as starch can. He named this new substance "cellulose" because he had obtained it from the cell walls of plants. Glucose: Also known as blood sugar; a simple sugar broken down in cells to produce energy. As the chief constituent (or main ingredient) of the cell walls of plants, cellulose performs a structural or skeletal function. Just as our hard, bony skeletons provide attachment points for our muscles and support our bodies, so the rigidity or stiffness found in any plant is due to the strength of its cell walls. Examined under a powerful microscope, fibers of cellulose are seen to have a meshed or criss-cross pattern that looks as if it were woven much as cloth. The cell wall has been likened to the way reinforced concrete is made, with the cellulose fibers acting as the rebars or steel rods do in concrete (providing extra strength). As the new cell grows, layer upon layer of new material is deposited inside the last layer, meaning that the oldest material is always on the outside of the plant. Cellulose is one of the most widely used natural substances and has become one of the most important commercial raw materials. The major sources of cellulose are plant fibers (cotton, hemp, flax, and jute are almost all cellulose) and, of course, wood (about 42 percent cellulose). Since cellulose is insoluble in water, it is easily separated from the other constituents of a plant. Cellulose has been used to make paper since the Chinese first invented the process around A.D. 100. Cellulose is separated from wood by a pulping process that grinds woodchips under flowing water. The pulp that remains is then washed, bleached, and poured over a vibrating mesh. When the water finally drains from the pulp, what remains is an interlocking web of fibers that, when dried, pressed, and smoothed, becomes a sheet of paper. Raw cotton is 91 percent cellulose, and its fiber cells are found on the surface of the cotton seed. There are thousands of fibers on each seed, and as the cotton pod ripens and bursts open, these fiber cells die. Because these fiber cells are primarily cellulose, they can be twisted to form thread or yarn that is then woven to make cloth. Since cellulose reacts easily to both strong bases and acids, a chemical process is often used to make other products. For example, the fabric known as rayon and the transparent sheet of film called cellophane are made using a many-step process that involves an acid bath. In mixtures if nitric and sulfuric acids, cellulose can form what is called guncotton or cellulose nitrates that are used for explosives. However, when mixed with camphor, cellulose produces a plastic known as celluloid, which was used for early motion-picture film. However, because it was highly flammable (meaning it could easily catch fire), it was eventually replaced by newer and more stable plastic materials. Although cellulose is still an important natural resource, many of the products that were made from it are being produced easier and cheaper using other materials. Despite the fact that humans (and many other animals) cannot digest cellulose (meaning that their digestive systems cannot break it down into its basic constituents), cellulose is nonetheless a very important part of the healthy human diet. This is because it forms a major part of the dietary fiber that we know is important for proper digestion. Since we cannot break cellulose down and it passes through our systems basically unchanged, it acts as what we call bulk or roughage that helps the movements of our intestines. Among mammals, only those that are ruminants (cudchewing animals like cows and horses) can process cellulose. This is because they have special bacteria and microorganisms in their digestive tracts that do it for them. They are then able to absorb the broken-down cellulose and use its sugar as a food source. Fungi are also able to break down cellulose into sugar that they can absorb, and they play a major role in the decomposition (rotting) of wood and other plant material. Nevertheless, most cellulose in feed fibre is lignified. In fact, the usage of cellulolisic feed did not reach an optimum level. 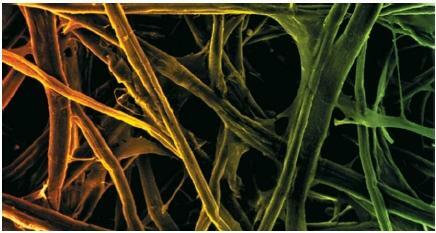 Therefore we need a strategy to cut the bond between cellulose and lignin in feed fiber. thank you for giving the best answer. i can now use it in my research paper. A great read, really clarifies and simplifies cellulose while outlining other key concepts. Thank you so much for writing it! we like the picture, thank you! it helped us with our biology presentation, we love cellulose! Is their any possibility to get the nano sized cellulose to degrade the micro fibril cellulose by using cellulase enzyme? if so , kindly send me. what humans could use 2 build up fibre in our bodies? If humans could digest cellulose, how would that help them? What chemicals are used in the processing of cellulose? Are these chemicals in food cellulose? What is the chemical distribution of cellulose in a plant? Thanks alot. U have been of help to me. But plz plant cellulose and commercial cellulose are they the same thing? This was the best web site ive ever been on! Its been alot of help and im sure to pass this now! My son has a science fair project and the topic is the using the enzyme, cellulace, to break down a corn husk into cellulose then to glucose for human consumption. He has to test the glucose after the breakdown. I have the enzyme and now I am not sure what to do to help him out? Any suggestions? im a high school freshman and having trouble with biology homework. which of these elements are not found in cellulose? Carbon, hydrogen, oxygen or nitrogen. this article was very help full when it is needed and i indeed say that this article can learn and educate students a lot. Thank you for writing this but I have a question: Is it safe for humans to consume cellulose even though we cannot digest them? Is there any negative or side-effects? Is cellulose harmful to our health? If its safe to consume, is there any percentage limit consumption? And how, if we can, do we know how much cellulose is in a food or fruit or fruit peels? I would really appreciate it if anyone can answer my questions. Thank you very much. I really need to know ways to spread cellulose on agricultural fields. Can someone pleas help me? Great work, made me understand a lot about cellulose. Thank you much. Anyway, can you elaborate on some of the specific properties of cellulose needed by the paper industry? thanks 4 giving such informations, this helped me a lot. This have assisted me to compile my assignment. Is is very helpful and quite informative. Why is cellulose considered a "low calorie" food? dear all i need information related to nanofibers of cellulose used in water desalination. any one can provide me litrature related to the said topic. i also want to visit membrane manufacturing unit either in pakistan or america. Thank you for writing this currently studying Nutrition found this helpful. Cellulose for the human it is an imprtant part of a healthful diet.Why?? Is it possible to have a cellulose skin infection?How? Excellent article, could this article be elaborated like giving information about Micro crystalline Cellulose, sodium CMC, Bleached Cotton linters, Poly anionic Cellulose, Cross Carmellose etc.